Solution for Pharmaceutical Industry that enables the automation of the reporting system of the companies. CBO Net Reporting Module allows you to systematize working plan of human resources through a simple system and provides an easy and reliable way for reporting. It Provides you ‘Web’ based solution which enables you to report the way you want. Reporting can be done through SMS also, which makes the executive capable for Instant Reporting. CBO Net Reporting allows to fill daily and monthly working plan of the employees through a simple system and provides an easy and reliable way for reporting. This system is specially designed to keep track of the employee’s performance. Through this application an employee can fill his daily reports at different locations. They just need to log-on to the application from anywhere, and fill the forms required. Data captured is processed by our system to prepare reports. System uses a wide variety of charts, pivot tables and tabular view components to build insightful reports and dashboards. System provides reports to other resources or higher authorities of the organization. • Doctor wise sale vs. profit & loss ac. 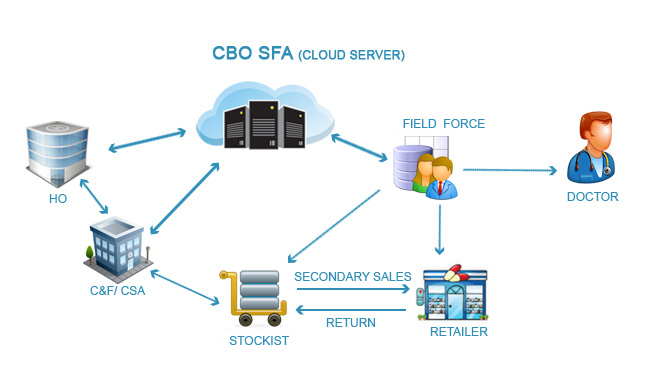 • Online sale / sales return register for field force Reporting Software.